It seems to me that the gold price is consolidating within a bull trend…and may be close to a bottom. 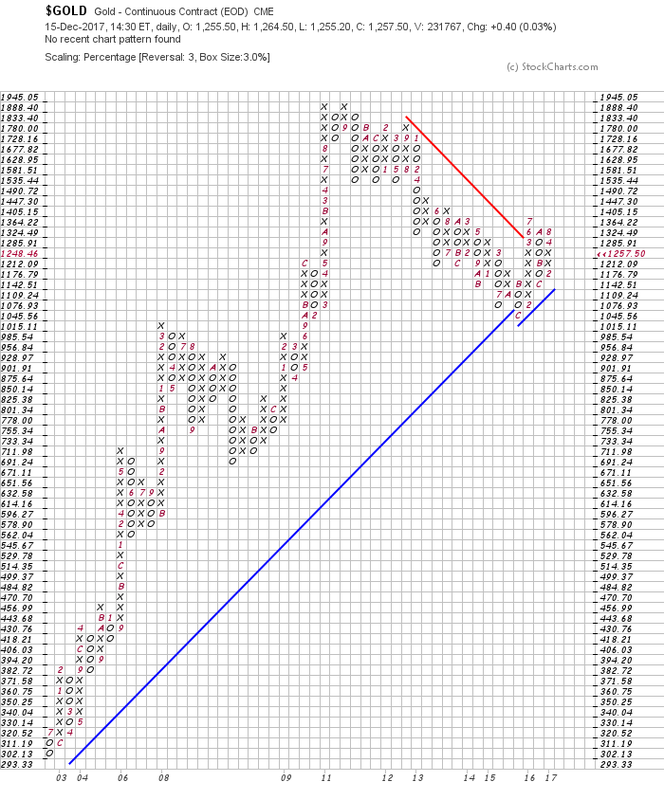 Below is a P&F chart (3% x 3 box reversal) of the gold price. Note that both the RSI and the MACD oscillators have rising bottoms - which implies that the sentiment is more bullish than bearish, but not sufficiently so to be able to take a contrarian position. In my view, there are three highly visible markers that are pointing to a coming dislocation in the capital markets. The first is the 100 year chart of the $SPX below, which shows that the SPX has tripled since 2008 - which is beyond the bounds of rational behaviour - and it is approaching the upper boundary of the ultra-long term upper resistance line of a rising channel. The probability of it significantly penetrating that upper channel line is vanishingly small because that would imply a structural change in human attitudes to value. In turn, such a development would turn all financial knowledge on its head. So I will stick my neck out: IT WILL NOT HAPPEN!! 2. Kim Jong Un has effectively been corned by Trump and his only options will be to capitulate or attack. The war of words is likely over and the consensus is that he will attack. Personally, I can't see a nuclear war coming because the outcome would be a scorched planet. More likely will be a rash of regional conventional wars which serve to stimulate industrial production in war related industries. This will serve to support economic activity but will not be "bullish" more likely it will be mildly bearish. 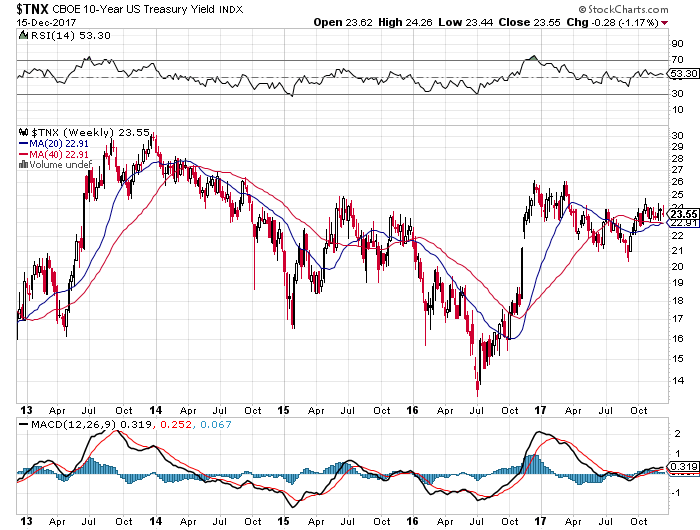 The chart of the ten year bond yield below does not seem to expecting any fireworks - from an outbreak of war or anywhere else. Its oscillators are also in neutral territory but are showing a tendency to rise rather than fall. There appears to be an inverted Head and Shoulders formation on the ten year yield chart with the neckline at around 2.6%. If this is penetrated on the upside, the yield could rise to around 3.8% before it hits headwinds because of bad debts that will flow from an inability of borrowers to service incremental debt. With all the above in mind, gold will likely become a "temporary" safe haven in the coming Primary Bear Market in equities and bonds. The reason it will be temporary (maybe a few years) is that interest rates cannot rise without threatening an implosion of the debt mountain. Thinking outside the box, it seems to me that the throwaway era of consumerism is drawing to a close and that the badly misunderstood era of Artificial Intelligence is upon us. Marketing 101 tells us that Free Enterprise opportunities arise in response to "needs". In the case of A-I the "needs" are not immediately apparent. No one "needs" a robot vacuum cleaner, for example. No one "needs" a driverless car. Yes, A-I will lead to lower costs of production, but it beggars belief that A-I will add to the cumulative revenue line that drives GDP. Therefore, the era of "growth" that has supported the Central Banks philosophy of controlled inflation since 1913 is unlikely to be supportable by Central Bank activity in the future. The world is entering a "tread water" era which implies that printing money will not achieve growth - either real or artificial. 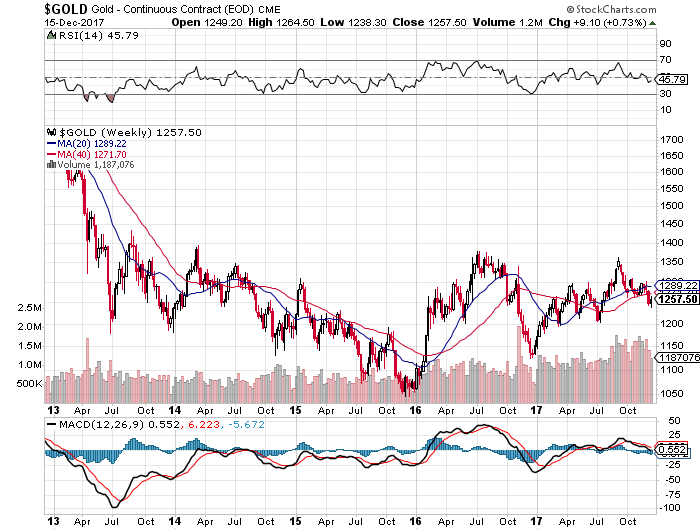 Gold seems to offer an attractive "investment" opportunity if one takes a 5-10 year view. Thereafter, who knows? P.S. As a person who is biased towards optimism, I view the above as a positive trend - towards a realisation that quality trumps quantity in life. When that realisation finally dawns on the majority in society, the world will enter a period of peace - where material possessions will be bought for their practicality rather than for ego massaging reasons. I am looking forward to the "kinder, gentler world" that President H W Bush was hoping for - but then he admitted to having trouble with "the vision thing"